Holiday in San Gimignano: dive in the pool of villa Podere Arianna! Nice and large farming estate (400 hectares) comprising 2 farmhouses set in peaceful and beautiful location, enjoying extensive views on the hills surrounding San Gimignano. 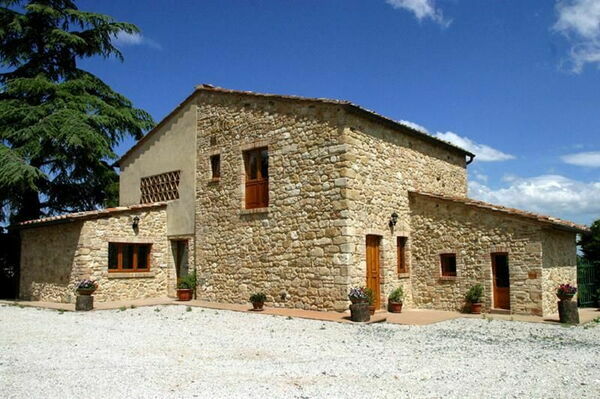 The property offers 5 charming apartments, all of which tastefully furnished in a rustic Tuscan style. Distances: San Gimignano all kinds of shops 6 km, Castelfalfi with golf course (18 holes) 20 km, the Etruscan town of Volterra 30 km, Siena approx. 50 km, Florence approx. 60 km, Pisa (airport) 80 km. The beaches of Marina di Cecina are approx. 70 km away. At guests’ disposal: large equipped and fenced-in garden with swimming-pool (5 x 10 m - open from 15/05 to 30/09). The access to the property is via an unpaved road of approx. 1,5 km. Pets are allowed. Extra services: extra bed available upon request at Euro 100,- / per week (to be paid on the spot) and baby-bed available free of charge. To be requested when booking and to be paid on site: breakfast service, cooking lessons, wine tasting (minimum number of people requested) in the characteristic center of the farm 200 m away. The olive oil and the Vernaccia (renowned white wine typical of the San Gimignano area) are available for clients to be purchased. Arrivals must be on Saturdays before 19.00. 220 m2 Small independent house. Ground floor: large dining-room, bright kitchen (oven, freezer, dishwasher, washing-machine) with access to the outside, spacious living-room (TV) with access to the outside, toilet. 1st floor: double bedroom, twin-bedded room, 2 bedrooms each with a single bed, bathroom with tub, bathroom with shower. Additional costs paid on site: Security deposit: € 150,-Final cleaning: € 90,- Heating: according to consumption. Local Tax: 1,50€ per person/per night for the first 10 nights of stay. (Not applicable to children under 12 years).